Kunafa is a very popular Arab sweet or Arabic dessert with cream cheese filling or with cream. A sweet that has a melt in mouth cheesy flavored inner with a crispy crust. 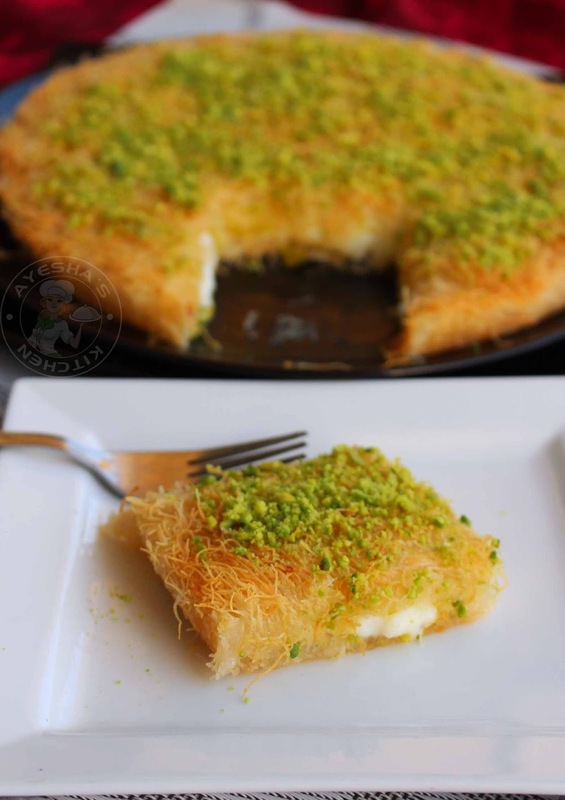 Nowadays this sweet is made with kunafa dough/kataifi pastry which is easily available in frozen section of any middle eastern grocery. This shredded phyllo dough crisps up well. But traditionally this sweet is made from extra thin noodles of semolina flour. 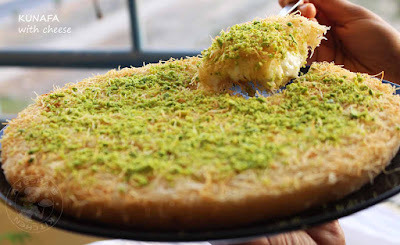 The Lebanese cheesecake knafeh is basically the same kunafa itself. But for this Lebanese cheesecake, floral water is used for flavoring instead of sugar syrup. 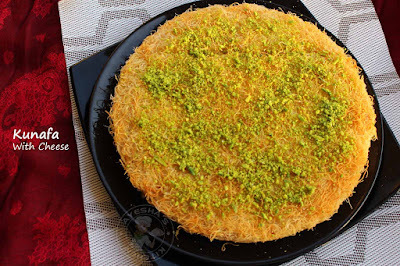 So let's move on to the recipe showing how to make kunafa with cream cheese filling. Here is my recipe with step by step pics which helps you to make this yummy dessert quickly and easily. Hope you all give this dessert recipe a try. I strongly recommend this sweet as it is heavenly delicious and worth a try. Loosen the kataifi / kunafa dough in a large bowl and crush it well using a food processor. You can also loosen the dough with your hands. When done, add 5 tbsp of melted unsalted butter little by little until the whole dough is well combined with butter. Now grease a round cake pan with 1 tbsp of melted unsalted butter. Grease the sides too. Layer half of the buttery kataifi dough in this greased pan and press down lightly and evenly. PREPARE THE CHEESE LAYER - For that boil the milk in a deep bottomed pan. Mix the all-purpose flour and cornflour in 2 tbsp of water and combine well. When the milk starts to boil, reduce the flame to low and add this mixture to it and stir continuously without any lumps until to form a thick paste(very important). Then add 3 tbsp of sugar. Mix well for a while and then add cream cheese. Stir well to form a very thick cream. Be careful, after adding cheese cook for few seconds and remove from flame. The consistency must be very thick. Pour this prepared cheesy mixture over the prepared kataifi base and spread evenly. Top it with some shredded mozzarella cheese (optional). Cover with remaining half of the kataifi dough and spread evenly and then press gently with your hands. Now either you can bake in an oven or can use stove top baking. Bake in a preheated oven at 180 degrees C for 30 - 45 minutes or until it turns light brown. OR IF U PREFER STOVE TOP BAKING, REFER NOTES GIVEN BELOW. PREPARATION OF SUGAR SYRUP - Bring to boil sugar and water in a vessel. When it starts to boil add lemon juice. Stir well and cook over a medium flame for 10 minutes. Once the kunafa is done, take out the kunafa from the oven and pour the sugar syrup immediately over the hot kunafa evenly. Let it cool for 5 -10 minutes. Using a knife loosen the sides and flip it to a plate (now it looks upside down). So again flip to another plate immediately. Garnish with powdered pistachios. Slice and serve warm. If you are using gas top baking, keep a steel/ aluminum big mouth cooking pot on the stove. Turn on the flame and preheat it for 5 minutes and then place the cake tray with kunafa inside it. Cover the pot with a lid and make the flame very low. And then bake for 30 - 45 minutes.